Tiled flooring is often a top choice for bathrooms around the world. It looks elegant, is easy to maintain and are available in a variety of colours and materials, from the more affordable ceramics, to the sleek and glossy porcelain. Both of which are impervious to moisture and therefore make a fantastic choice that is durable too. 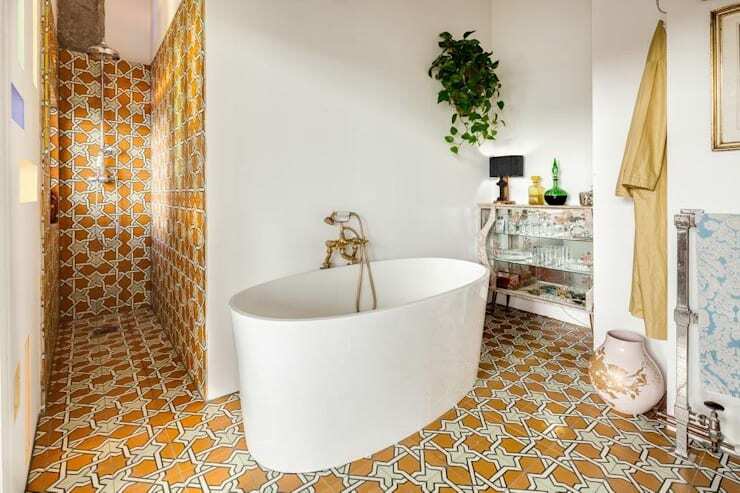 These 15 amazing bathroom designs have taken tile styling to the next level, creating a cool, calm and collected décor that is comfortable and beautiful. Our first image shows off the simplicity of Scandinavian décor. The bathroom is decorated in tiles with various shapes, colours and patterns. The floor tiles display a beehive shaped design, while the walls are styled with rectangular tiles arranged in a herringbone pattern. This bathroom design is excellent. 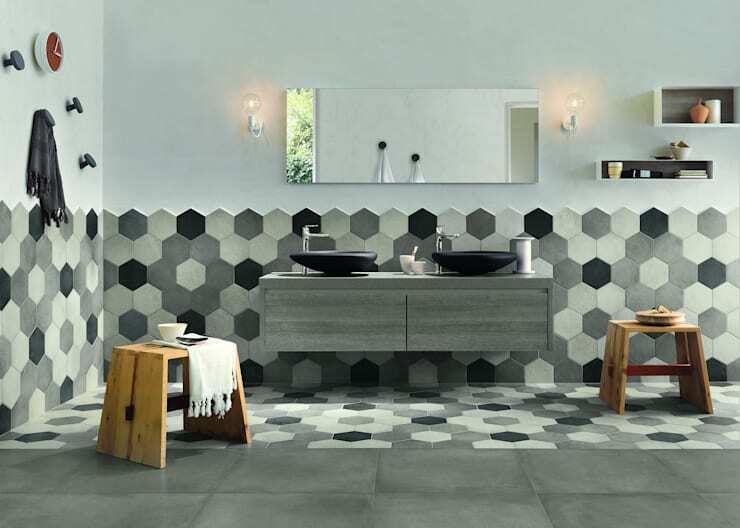 From the use of a neutral colour palette, featuring white, grey and black hexagonal tiles that decorate the floor and a part of the wall as well. 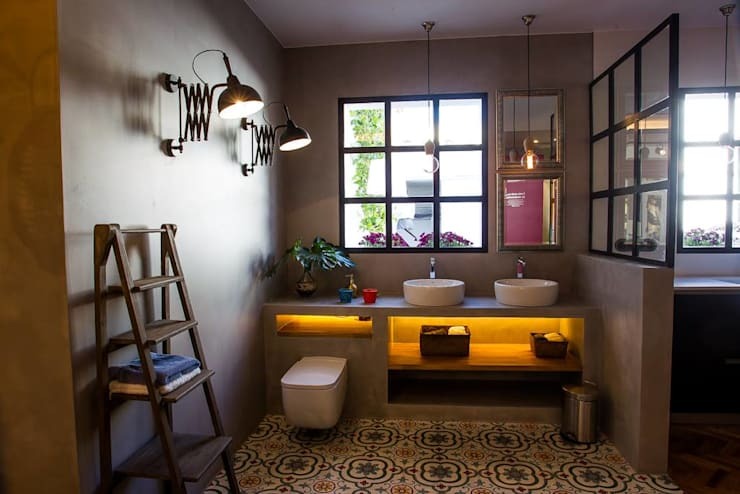 The combination of colours along with the wooden stools creates an attractive and appealing effect to this bathroom. This bathroom is the epitome of vintage luxury and elegant décor. 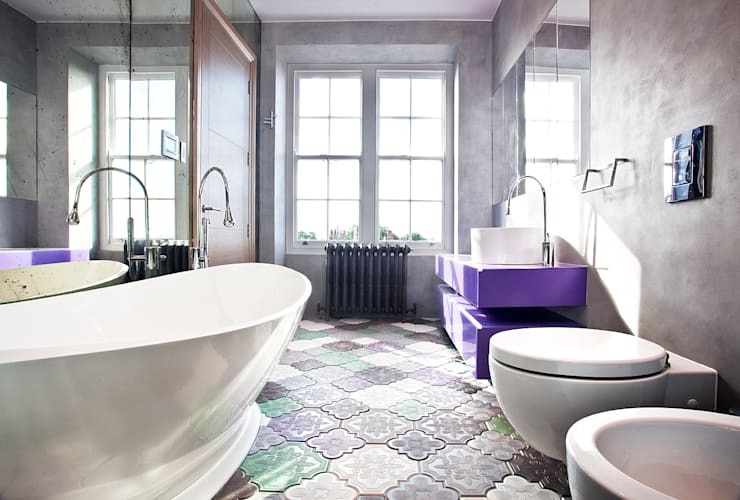 There is something so vibrant about this bathroom that is dominated by shades of grey and purple. The mirrored panels create an illusion of space, while the tiled flooring is absolutely different. This textured porcelain tile with a matte finish is an elegant non-slip choice for the exceptional bathroom. And with so much natural light adding to the calming effect of the indoors, this décor is perfect. This bathroom design has an undeniable retro vibe. 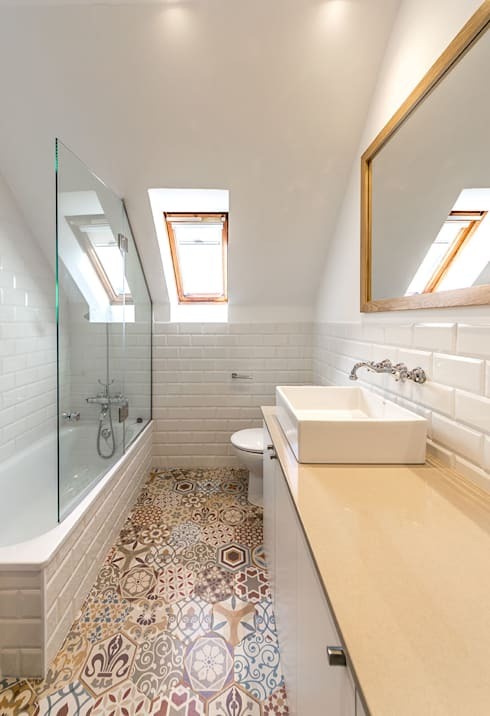 The shower room is however a modern take on the old-fashion style, and is spacious too, while the mustard yellow tiles, along with contemporary fixtures and fittings makes this bathroom an artistic and elegant design. 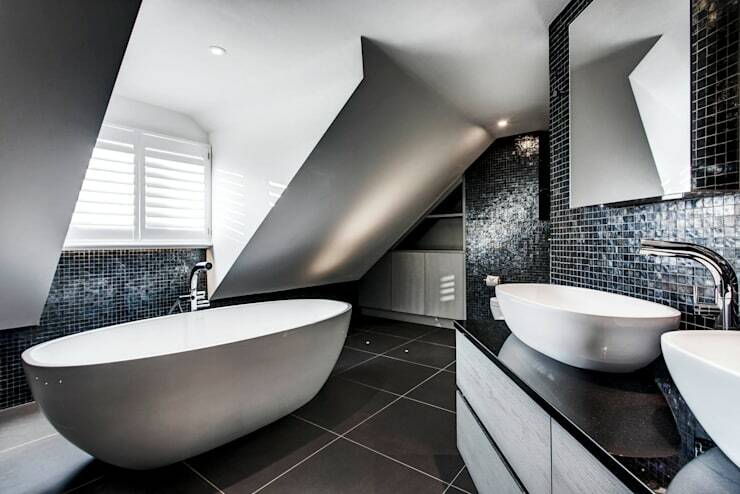 Just because your bathroom is located in the attic, doesn’t mean it shouldn’t be stylish. 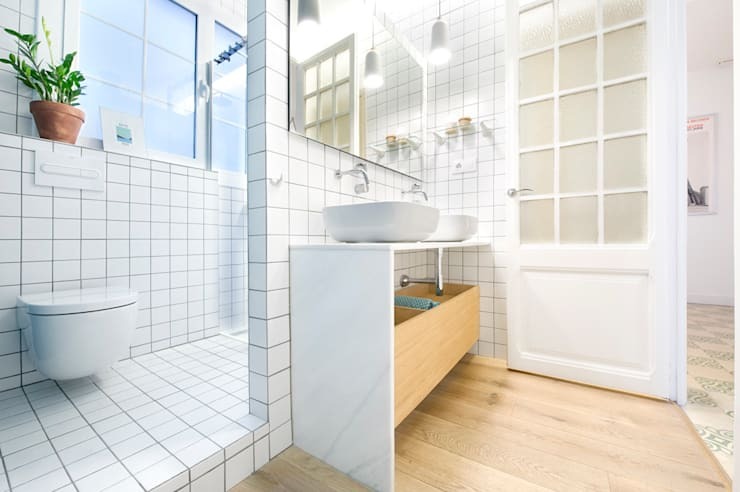 Consider this white interior and fantastic patchwork tiled flooring for a great décor option that is pretty and tidy. 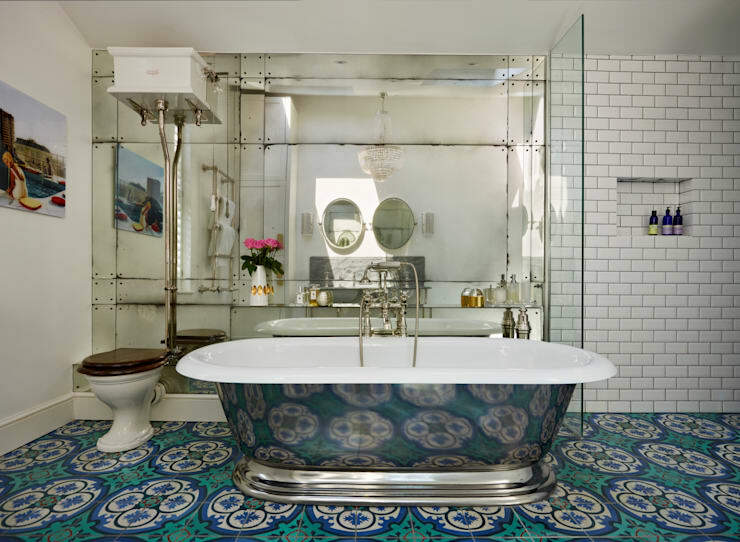 This classical bathroom is elegant, opulent and colourful. The blue tiles create a Mediterranean-inspired décor. 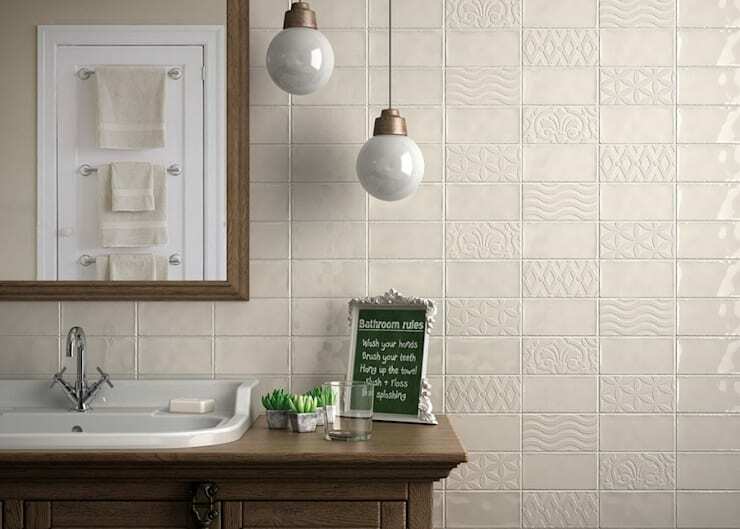 The wall tiles have a contemporary element that is modern and stylish, while the rest of the accessories are ideal for any vintage-loving individual. 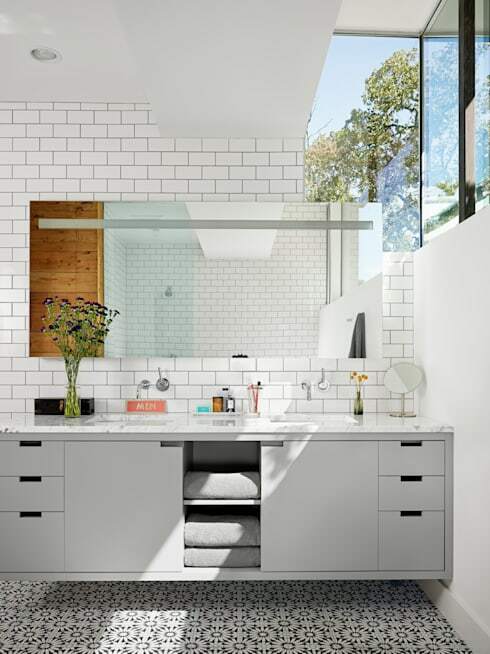 You may want to contact a bathroom designer to get this look for your home. 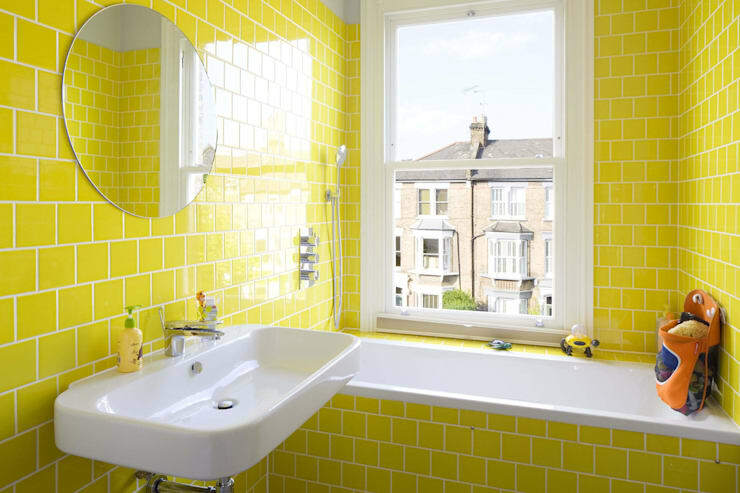 A vibrant yellow such as this may be an unusual choice for bathroom décor, but this sunshine colour design is styled, quirky and instantly mood lifting. It’s definitely the perfect choice for a small bathroom that needs uplifting. This neutral colour bathroom is a great choice, especially if you look closely at the tiles that have subtle patterns, creating an etched effect that it was etched into the wall. The accessories and fixtures are a fitting element to the design as well. 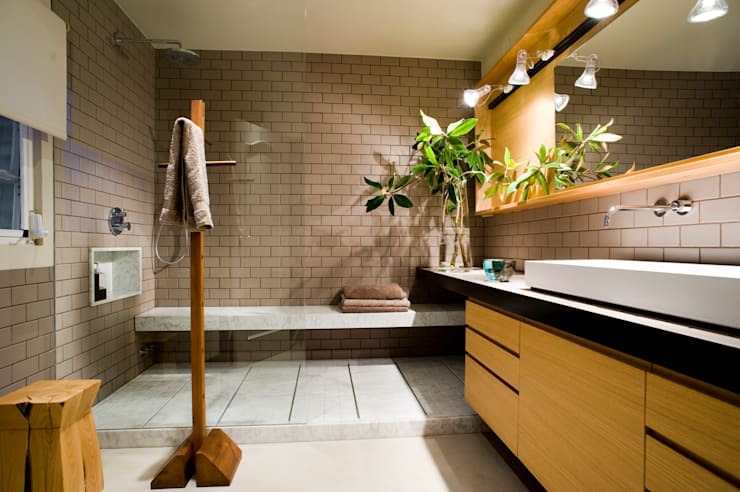 A bathroom design such as this is elegant, earthy and comfortable. The wooden vanity is a chic choice of décor, while the mirror and potted plants create a modern oasis effect that is accentuated by the brilliant illumination. A bright and cheery bathroom is definitely a fascinating choice in light colours for bathroom décor, this one is a combination of cool colours and an amazing mirror that brightens up the interior even more. The flooring here is extravagant and classy, with marble slabs creating a fantastic effect. The shower however has a more delicate patterned tile adding to the décor, and it showcases spectacular style too. The mosaic floor tiles along with this darker toned bathroom décor may be a gorgeous and rustic choice to add pizazz to your bathroom. The under counter lighting however ensures that you will be able to find all your essentials easily. 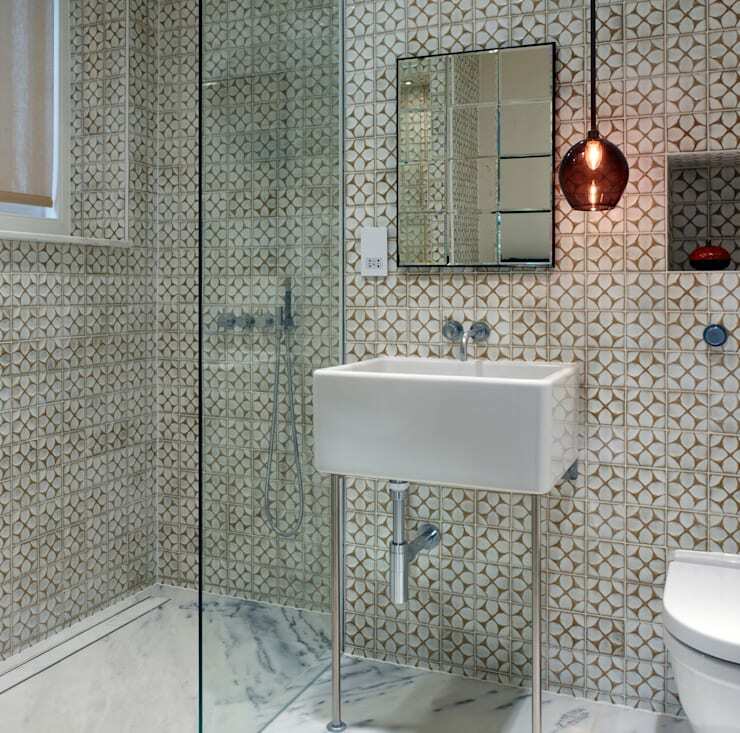 This luxurious bathroom décor with the glittering mosaic tiles is sleek and stylish. The perfect choice for minimalist home. It’s contemporary, spacious and filled with elegance and drama. We’ve come to the end of our Ideabook today, but we have to consider the most tranquil and serene bathroom in our creative tile feature. This small bathroom shows meticulous attention to detail, simple design and part of the bathroom has even been decorated with wood flooring for a cosy effect. However, the toilet area and shower zone is completely clad in tiles, adding a sleek décor to this neutral bathroom. Now how about these: 9 Gorgeous, Colourful Bathrooms Perfect For Your Home!? Which creative tiling did you like the most?